When more than one person owns a car, there are three different ownership options. Each option directly affects what needs to happen to sell or perform any other MVD function for that vehicle. How do you know which option you have? Look at the word between your names, usually found at the right side of your title. are not required. If you choose this legal status, then only one owner must sign in the Legal Status section. This legal status is recommended for most situations. 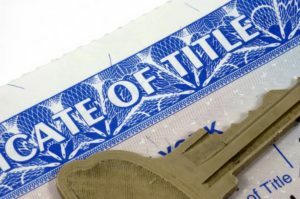 For estate planning purposes it is advised that couples take title to vehicles in this way, so that when one dies the other automatically becomes 100% owner. 2) If it’s an And – John Doe AND Joe Ross – then this ownership is a tenancy in common. To transfer ownership of the vehicle, license plates and/or fees or to record loan information, then signatures of both parties will be required. In the event of the death of either party, the interest of the deceased party must be handled by probate action or by completing a non-probate Affidavit. This is used mostly for legal entities, not for the general use of the public. This ownership option is only advised for people who are not related and that if one dies, that person’s estate becomes the 50% owner of the vehicle. 3) If it’s a And/Or – John Doe AND/OR Jane Doe, then this is a joint tenancy with right of survivorship. To transfer ownership of this vehicle, license plates and/or fees or to record loan information, the signatures of both parties will be required if both are living. Upon proof of death, the survivor may sign alone. This is the most confusing entity. It looks like you have a choice of AND or OR, but that isn’t true. It’s deceiving because it still requires both parties to sign for any function of that vehicle. Check your titles, if you need to change the legal entity, we can do it for you in a matter of minutes. Call one of our friendly staff for details.